I’ve just been interviewed for a website called FirstSiteGuide designed to encourage and inspire fledging bloggers. Is your blog a profession or just a hobby? When did you get an idea to launch your own blog and how important is it for you be online? If you’d like to read the whole interview, you can find it here. They also have a beginner’s guide to web hosting. What are your 2-3 favorite writing habits/rituals you find helpful? If it’s in your head, get it out! Writing really helps me to formulate my ideas, especially if I know other people are going to read it (I also keep a diary for myself), and to let go of negative thoughts by pouring them on to the page/screen. Having said that, for some posts I like to think about them for a while, so that when I finally get to writing them, it’s quite a quick process. Sometimes I don’t have a choice about this – over the last few months I’ve had lots of ideas for posts, but little to no time to do anything about them! This is a difficult question. I think this is the flipside of the previous question, in that some of my posts take quite a long time to write, and while I love doing it and love the response I get, I can end up spending way too much time in front of the computer, so I need to find more of a balance. What is one new idea (tip, habit) you would like to start in 2015, and why? Not sure about this one either – perhaps it’s something I started doing towards the end of last year. 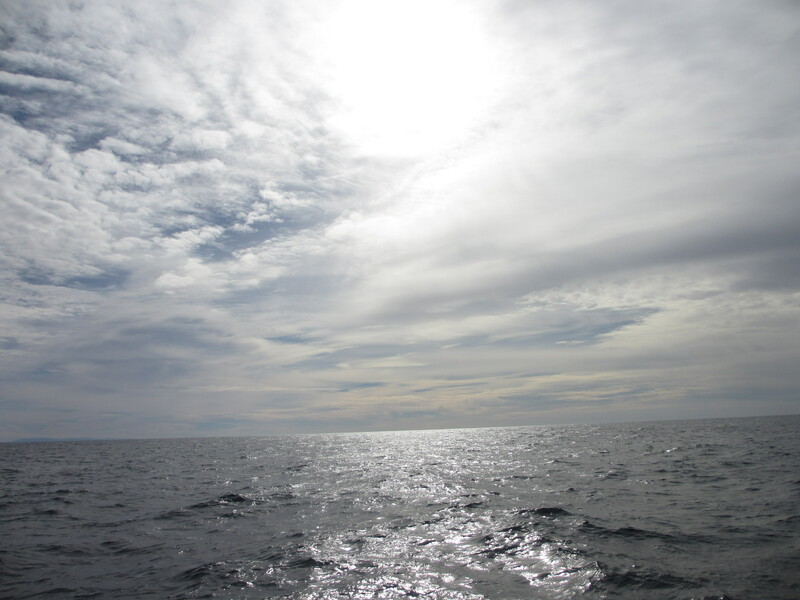 I began to create a draft post for each of the ideas that have been kicking around in my head, in the vain hope that when I have some time to write, I already have at least the title and perhaps a few ideas already written on the paper. Reading Mike’s comments on Zhenya’s original post, perhaps I should also try to make some of my posts shorter, or break them into separate posts. Not sure if that’s a good idea or not though, as I find trailing through lots of different posts can get a bit annoying sometimes! The interim 298 posts have been a voyage in professional discovery. Coupled with the many blogs that I read, the conversations that I have on social media, and the conferences I’ve been lucky enough to go to, as well as the professional support I’ve had from all of the great IH schools I’ve worked at and my Delta, my blog and the ensuing comments have encouraged me to reflect on what I do in the classroom and really think about why I do it. Going back to my original post, I now use a lot more technology in the classroom, but I’m also much more aware of when it’s not appropriate. I’ve learnt how and when to apply it, and I’m constantly experimenting with technology, among many other things. This is just one example of how joining the online teaching community has shaped my teaching. In addition to what happens in the classroom, my writing style has developed hugely thanks to my blog, and I’ve branched out from being purely professional-focussed into sharing other aspects of my life as a teacher, including some of the bad bits, and some of the things I am witness to thanks to living in other countries and being from the UK. I’ve also learnt a lot about putting together posts, the most important of which is to always include an image – it makes it much easier to share it, and a bit more interesting to look at. It breaks up the text a bit too! 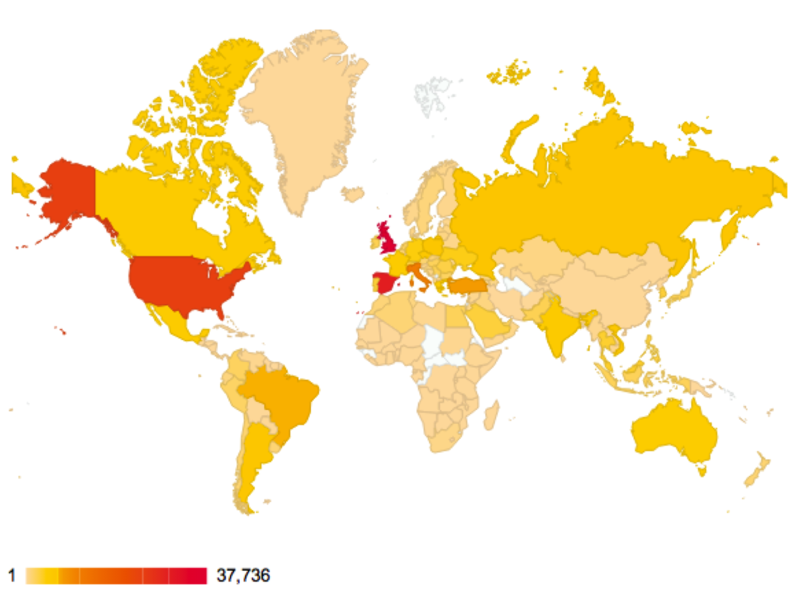 This is where my readers have come from since February 25, 2012. Thank you! When people come up to me and say they’ve read my blog, there’s always a little voice in my head saying ‘Wow, how did that happen? How did I get to this?’ When I first started writing it, I wondered what I could add to all the great blogs I’d already been reading for a few months and I thought ‘No-one will ever read mine’. I decided to write for myself, and looking back over the blog is a great record of my professional development. I still write what I want to write, when I want to, without worrying about any kind of schedule, but now I know that someone somewhere will hopefully find each post useful, and I love the discussion/comments/other posts that come out of what I write. They make me think and inspire me to keep writing. Last week, largely thanks to the TeachingEnglish British Council facebook page, which I cannot recommend highly enough, I reached over 300,000 views on my blog. This happened at the same time as my highest single day’s views (11,011) from this guest post by Tereza Eliasova on praise and feedback, which also meant that in May so far (it’s the 6th as I write this) I already have more views than I have had in any other month in the nearly four years I’ve been writing my blog. I find this phenomonal, and slightly scary! Adam Simpson and I were interviewed by Paul Braddock and Ann Foreman from the British Council, as part of the IATEFL Harrogate online coverage. It was a great privilege to be asked to do this. We were asked about what makes a successful blog and how we go about blogging. The interview is just under 8 minutes, and I hope there are some useful tips in there. Adam’s blog is www.teachthemenglish.com, and if you’re not already following it, you should be. Paul and Ann run the highly successful TeachingEnglish facebook page, which is a treasure trove of resources. All five of us have benefitted from it, and it’s great to be able to give something back. Follow the conference and watch recordings of sessions and interviews by clicking the image! I decided to interview Laura Patsko and Katy Simpson. I first saw Laura present at the IH Prague conference a few years ago, although we didn’t meet until later. Katy and I worked together at IH Newcastle. We all spent a lot of time together at IATEFL Liverpool, and it’s great to see how their shared interest in ELF (English as a Lingua Franca) has developed into the blog they’ve described below. For this interview, I used the same set of questions that Lizzie gave me. Follow the conference and watch recordings of sessions by clicking the image! We’re Katy and Laura, and we are particularly interested in the use of English around the world as a lingua franca (ELF). Katy is a full-time teacher at the British Council in Dubai, and Laura is a full-time teacher and teacher trainer at St George International in London. We both became increasingly interested in ELF as we studied for our master’s degrees and conducted research in this field. 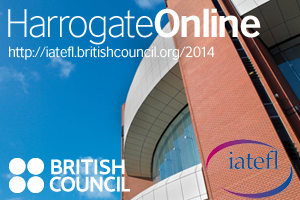 Could you give us brief details about your session at IATEFL 2014? Our session (30 minutes) is based on the fact that many speakers of English in the world today are using it as a means of communication when they do not share a first language. In other words, English is their ‘lingua franca’. They may rarely or never communicate with ‘native’ speakers of English, and are unlikely to need or want to sound like a ‘native’ speaker. Our session will outline some practical implications for this and explain a few basic classroom activities that teachers can use to help their students be more intelligible in an international (ELF) context. Why are you interested in the area you’ll be presenting on? When we were researching ELF for our MA courses—and simultaneously teaching full timetables to learners in multilingual classrooms—we began to realise that these students were using English together as their lingua franca, and many of them would use English in this way outside the classroom, too; but it was very difficult for us to help them do this better when no bespoke materials existed for developing this use of English. Though they have produced many excellent guides on different pronunciation varieties and plenty of resource books full of useful practice activities, ELT publishers are still quite conservative; and very little material exists for teachers working in an ELF context. Most material is based on ‘native-speaker’ norms, but ‘native’ speakers are hugely outnumbered in the world today and many of our students were/are unlikely to use English with native speakers. If they don’t want/need to sound like a ‘native’ speaker, but need to be intelligible to other ELF users, how can we help them do this when knowledge of ELF is still quite minimal among practising teachers and no suitable material exists? What should your audience expect to learn? Our audience can expect to take away some simple activities for developing and practising listening and pronunciation in an ELF context. They will learn why this is relevant for so many English language students in the world today, and how it does not necessarily require teachers to dramatically alter their usual classroom practice, but simply reconsider their notions of ‘correctness’ and ‘intelligibility’. Do you blog? Could you tell us about your blog(s)? We blog at elfpron.wordpress.com. We aim to make the theory and practice of ELF more understandable and accessible to teachers who are working in ELF contexts, and/or whose students use English as a lingua franca. There are a lot of misconceptions about ELF, which are only perpetuated if people can’t access information about it or have an informed discussion about its principles and implications. What other aspects of the conference are you looking forward to? We are looking forward to the great number of other presentations taking place this year regarding the use of English as a lingua franca, the nature of ‘native-speakerism’ in ELT and the practice of teaching pronunciation. And Open Mic Night, of course! Why did you sign up as IATEFL registered bloggers? We always have such a great time at the IATEFL Conference and take away plenty of ideas to experiment with in our classrooms. This is the first IATEFL Conference taking place since we launched our ‘ELF Pron’ blog in November 2013, and there are many sessions in the programme that are relevant to this field. We hope to incorporate what we learn from those sessions into the wider discussion on our blog! After the conference Katy and Laura posted a link to their slides and further resources on their blog. Really like the way they’ve put this together, and it’s fascinating for me too!